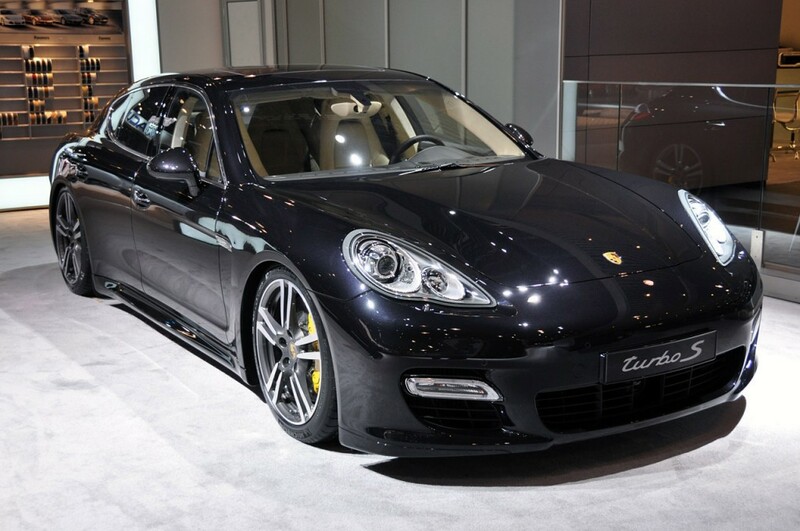 Porsche Panamera of Turbo S represents top all-wheel drive variant of model of Porsche Panamera. The model has been added in a lineup in 2011, together with Panamera S Hybrid, Panamera Diesel and Panamera GTS. Thus, it already the third wave of refills of a lineup from the moment of its base. Panamera Turbo S simultaneously became also top of all models, and showed technological power of the company as a whole. The basic difference from Turbo model – changes in the engine. The car urged to compete to such decisions as Ferrari FF, Aston Martin Rapide and, of course, Mercedes-Benz CLS 63 AMG. Release of version Turbo S the company first of all wanted to show model potential. It proves to be true that from model of Panamera of the Turbo already existing in the market not so is a lot of differences. Porsche Panamera Turbo’s S almost all advantages could be caught and on younger model, and even more cheaply, but all the same it would be not top company model. So, on huge addition to the account, the basic distinction of models is on a rear of the car. Panamera Turbo S is completed with motor V8 in volume 4,8 L, as well as at younger the Turbo. But it gives out on 50 h.p. of more capacity. It is reached not by change of algorithm of electronic control by the engine, and replacement of two turbochargers by more powerful. By the way, to squeeze out this difference in capacity it was quite possible, but, probably, this possibility is laid up on the future. The basic difference in the turbine is new turbine wheel. For Turbo S it make of an alloy of the titan and aluminum. Because of it the maximum temperature of an exhaust rose to 1050 degrees, and air pressure raised to 1,3 bars. Upon simply line you can and not feel difference between the Turbo and its more powerful relative, but the high-speed ceiling raised to 306 km/h. Speedup from zero to hundred occupies from this almost two-ton car of only 3,8 seconds! Far not racing car everyone truly is capable of the similar. To 200 km/h the car reaches for 12,9 seconds. 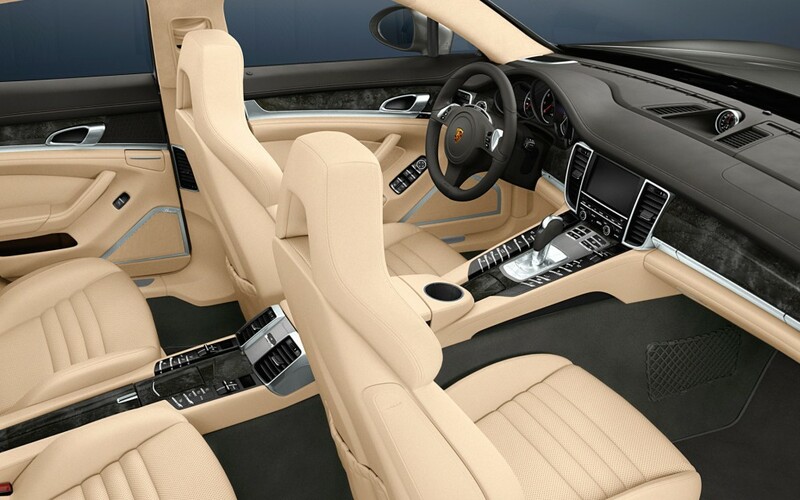 The car is completed only with the automatic auto gear box on seven steps – firm PDK. The car still manages to be economic enough – spends 11,5 l/100 of km in the commixed cycle, 17,0 l/100 of km in a city cycle and only 8,4 l/100 of km in the country. At all capacity and speed of the car the trip to the car brings only pleasure, even for the speed 200 km/h in interior is audible only minimum noise, and the steering wheel is supported by the special booster, and on similar speeds you will nervously not compress “steering-wheel” – all goes smoothly and conveniently. The car goes at once with complete set Sport Chrono, and you do not need to order it separately. It means presence of a mode of driving Sport Plus. It differs from usual Sport, for example, that pneumatic elements in a suspender disconnect one of two chambers, and the suspender melts more rigidly, and reaction of the engine to pressing of a pedal of gas strongly changes – melts more sharply. The road gleam is reduced at once on 25 mm. As a whole responses about this mode are not unequivocal, it suits more a racing track, than for a usual highway – by pressing of a pedal of a car throws, it speeds up very quickly. In interior there are throws and fluctuations. The optimum mode for fast driving is Sport. As a whole the suspender in Turbo S receives an uncompromising variation – here at once there are three modes of ruggedness of absorbers, there are stabilizers. Is as well firm traction system – PTV Plus. In general, all is engaged. The car goes by wheels in the size of 20 inches, in a balance weight 19-inch on the younger colleague (which all the same it was possible, but optional to replace on big). Ceramic clasp brakes are applied. It is possible to establish “ecological” wheels on 19 inches – the lowered resistance качению in that case will reduce fuel expenses. But then firm carbon-ceramic brakes RSSB are not located. In general it is difficult to think to the logician of such manipulations for the car capacity in 550 h.p., but the European “green” standards force to squeeze out of cars with DVS all possible and almost impossible. In interior of differences from younger model it is few. From obvious – availability of a combination of black color from below and cream from above which cannot be applied in others. Also there are distinctive mouldings on thresholds, but they are almost imperceptible. On the center of the panel traditional the sports chronometer, as well as at Porsche 911 models flaunts. The interior very qualitative, is executed from a skin, and can brag of excellent sound insulation. Porsche Panamera Turbo’s S almost five-meter car has the big width in 1931 mm – it occupies a considerable part of road. It powerful, big also looks as the model outrunning time. At the car there is a large quantity of the most various technologies. For fuel economy, for excellent qualities of a suspender, for dynamics improvement on road. Direct injection of fuel and VarioCam Plus anywhere did not get to. At great speed automatically moves the rear spoiler. It is possible to change height of a road gleam. It is possible even to open and close заслонку in the engine, simply that the sound became “sports” and scared passers-by. Getting Panamera Turbo S you receive, certainly, a top of a lineup of Panamera, and at purchase it is not necessary to think of additional packages any more, all of them already are present. The car aggressive and powerful, the engine phenomenally easily moves 1995 kg car. Dynamic qualities at height. And it is behind proud inscription Turbo S which can be underlined by exclusive color of the car – Agate Grey Metallic, inaccessible on other models flaunts. Here only and the car price corresponds to its status – over 175 thousand dollars in the USA.